Steven conducts the choir of Peterborough Cathedral in a wide-ranging repertory, and is Principal Conductor of the Guildford Chamber Choir, Peterborough Cathedral's Festival Chorus, and Peterborough Choral Society. He enjoys working with both professional and amateur singers, and has worked with instrumental groups such as The English Cornett and Sackbut Ensemble, Prime Brass, the Chameleon Arts Orchestra, Sinfonia Viva and the Guildford Philharmonic Orchestra. Steven founded the Guildford Chamber Orchestra and Guildford Baroque, and was Musical Director of Yateley Choral Society from 2003-2005. He has been a deputy répétiteur for the London Symphony Chorus, and worked on several productions with Bampton Classical Opera. Steven has acted as guest conductor for New Chamber Opera Studio, New London Chamber Choir, and the Eton Choral Course. 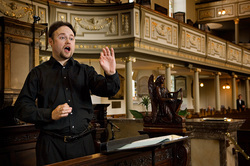 During 2006, Steven conducted liturgical performances of all of Mozart's Masses at St Marylebone Parish Church. Rehearsing in the Chapel of Magdalen College, Oxford.